I've come across several posts lately that discuss the whole concept of being a blogger. Blogging sure has changed hasn't it? I mean...there once was a time when no one paid any attention to an "average" person who posted things online. Blogging was more of an outlet for people to express themselves or even for people to keep in touch. Now, blogging can equate to a career. Heck, people are even quitting their jobs because they supposedly make enough income to sustain a lifestyle. Blogging sure has stepped up its game. Unfortunately, those who are "left behind" start comparing themselves to others. Then, the viciousness starts where people think "why not me?" and "what's wrong with me?" Surpassing the negative emotions is challenging. If thinking positively all the time was easy, there would be a ton of happier drivers on the road. Life truly is what we make of it. We'll never be perfect but, that's exactly why we're so unique. Just because you aren't written about in publications or receiving thousands of "likes" on your social media page does not mean your content is less worthy. Don't worry, I have fallen victim to this viciousness plenty of times myself. Since I primarily post about personal style, I sometimes sit back and wonder about certain looks and analyze photos to the point of obsession. (Like, this look isn't really that ah-mazing but, I love the lace kimono and the laid-back style of this outfit.) But, I really remember why I'm here. Comparison is a thief. But, I can surely take joy back when I want to. I really enjoyed this post and couldn't agree more! People have to remember what blogging is really all about. Blogging is a hard world these days! Thanks so much for sharing your thoughts! I think comparison is part of the blogging game- we can't help but do it, but we also can't let it defeat us. It's crazy how much blogging has changed in the last few years and I'm sure it will continue to do so. I struggle with this a lot! I compare myself to bloggers who have been doing this the same amount of time I have and I wonder why I'm not as "popular". But I have to remember that I'm doing this because I like it and that's the most important thing. I love the mix of the feminine lace and the distressed jeans! I 100% agree with all of your statements in this post. Good for you! It really can be discouraging to compare yourselves to the "big name bloggers", to wonder why you don't have more followers or likes and to consider yourself a failure for not partnering with the big name companies. But if you really are just doing it for yourself, it shouldn't matter! I love your blog. I Pin your outfits all the time because I think you have great style! For example, I love this kimono! I totally agree. While I'd love to blog every day like some of my friends, I realistically post 4 times a month, if that. I'm in it for the community and the creativity. The community is the best bonus, having people who share your obsession is truly gratifying. Like, I'm not the only one. Love this casual look! Especially how you missed all the prints and textures! AMEN AMEN AMEN to this whole post! I was reading it and kept on saying YESS! To so many things. You are so right girl. I love this, thank you for posting! I've been blogging for 5 years and its definitely changed SO MUCH. Not for the better either. Its sort of lost that certain feeling of ease, of just being yourself and not feeling like you have to keep up with others. I still absolutely love doing it, but I just wish it wasn't so competitive. I think we probably all fall prey to the whole comparison thing at some point but it's important to just remember we do best when we do our own thing. Yes to taking the joy back! This was a perfectly written post! I just started my blog up again because I got to burnt out on this thinking. But I missed doing it so now I'm doing it because its fun and I love it. :) Thanks for sharing! Love the outfit too. Such a fun kimono and tee. I loved how you paired the delicate colors into a very soft and feminine look! Comparing is never a good thing! It will only cause bad or hurt feelings. This was an excellent post Nancy! Really cool tee! Very well said Nancy! I am so guilty of thinking if I am a "real" blogger as you know. I have come to realize it's a fun hobby for me to connect with other people that enjoy fashion as much I do. What a pretty kimono, you always find great things at F21. Do you mainly shop online or in store at F21? i love this lil lace kimono!!! well written about comparison, if only positivity came more easy : ) but it's worth fighting for! loved reading this post! it has happened to me and when the green monster rears his ugly head i take a step back and take a few days away from blogging until I want to do post fun outfits that reflect me and noone else and I feel inspired. 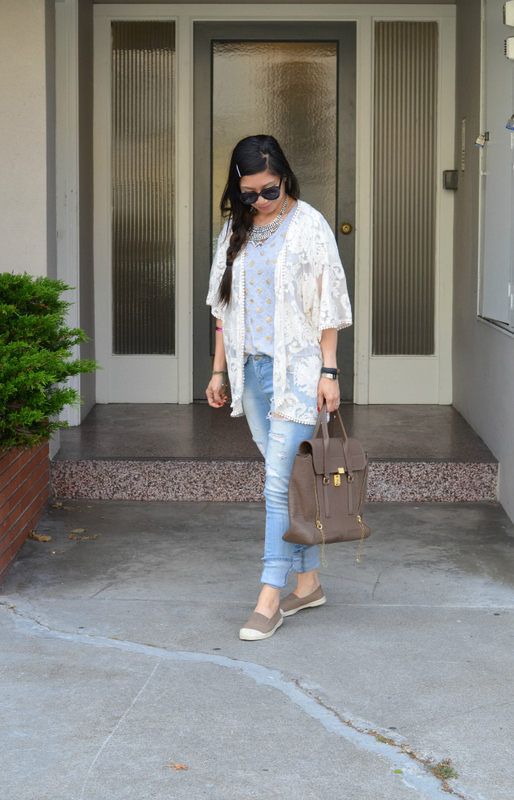 You are one of my fave bloggers, love this kimono too, I haven't jumped on that trend but i love seeing it! Agreed. Can't let comparison kill the good things, but rather act as a motivator for growth - whether it's in the blogging business or bettering self. Preach, girl. This is exactly what I've been thinking about with blogging a lot recently too. Especially since coming back from my little summer break and realizing just how hard it is to get back in the loop with everything is. In other news, I love everything about this look. Literally, all of it look perfect! You look fabulous! I am absolutely loving those distressed jeans! I'm not sure if my comment went through... so I'll try again. I've fallen victim to this mindset before, but thankfully for only a fleeting moment. Like you said, comparison is a thief ;) Anyways, love the kimono. It's so perfect for summer! I love the lace kimono, you look amazing! I struggle with this all the time. I know it's so vain, but sometimes you just can't help it. There are blogs I follow that post basically the same type of content I do and yet they have 478291471 followers, while I'm just sitting with 15 registered on bloglovin. I know there's more people that read my content and aren't subscribed/registered, but some days I just sit and think "why do I even try? I'll never be x-blogger". But I constantly remind myself that I do it because I enjoy it. I enjoy engaging with the readers I do have and I will never make a living out of it. Comparison is definitely a thief. I think every blogger has done it at least once. But yeah, I agree with what you had to say about it. You just have to be you. But speaking of thieves, I would so love to steal your jeans! Too cute. Great post, Nancy! Comparing yourself to others never ends well. We all want to be the best in anything we do, but if we keep comparing ourselves with others we only end up thinking of other people when we should be focusing on ourselves! Also, your kimono is so pretty! Well written post. Really people connect to other bloggers because they can relate to them or like them for some reason. They bring some sort of value to their lives. Also...case in point, my blog isn't "successful" in traditional sense, but I am currently writing this from the airport in Amsterdam where I just spent 10 days visiting 3 different bloggers that invited me over to the Netherlands to visit and have a brilliant holiday. I got to connect in person with 3 wonderful women I never would have met had it not been for my "unsuccessful" blog. I cherish these moments. They make life worthwhile and blogging suddenly becomes as Mastercard would suggest, "Priceless."